The collections and permanent exhibitions of the Mark Twain Boyhood Home and Museum are numerous and varied. If you have specific questions about items, please contact Museum Curator Henry Sweets. Mark Twain’s famous white jacket, believed to be the only one in existence. The Oxford gown worn by Mark Twain when receiving an honorary doctorate degree at Oxford University in 1907. One of Mark Twain’s pipes. Mark Twain’s writing desk and chair. Two watches, including the one presented to Mark Twain when he was honored at a banquet in Nevada in 1863. A bronze cast of Mark Twain’s right hand. First editions of all of Mark Twain’s major works and many shorter pieces and articles. 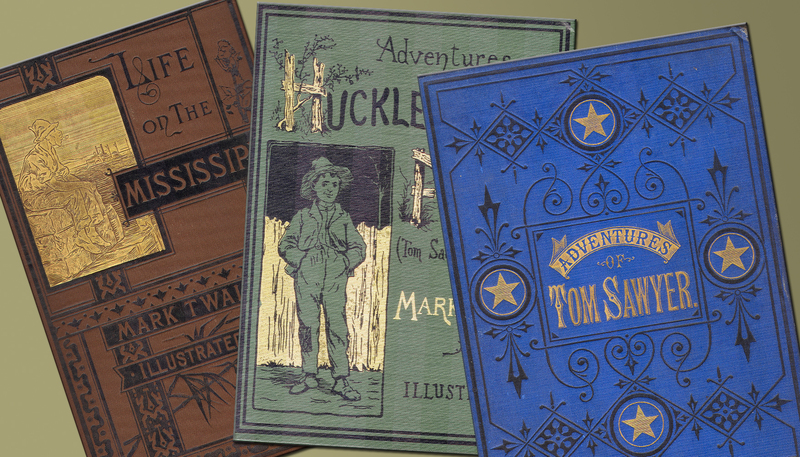 Large numbers of editions of Mark Twain’s books with strength in Tom Sawyer versions. Many foreign editions of Twain’s works. Books on and about Mark Twain. Mark Twain Ephemera such as advertising pieces for his works, handwritten manuscript for one chapter of A Tramp Abroad, autographed programs, advertising posters for his upcoming books, and many more unusual printed pieces. Letters: The Mark Twain Museum has more than 60 original Mark Twain letters. 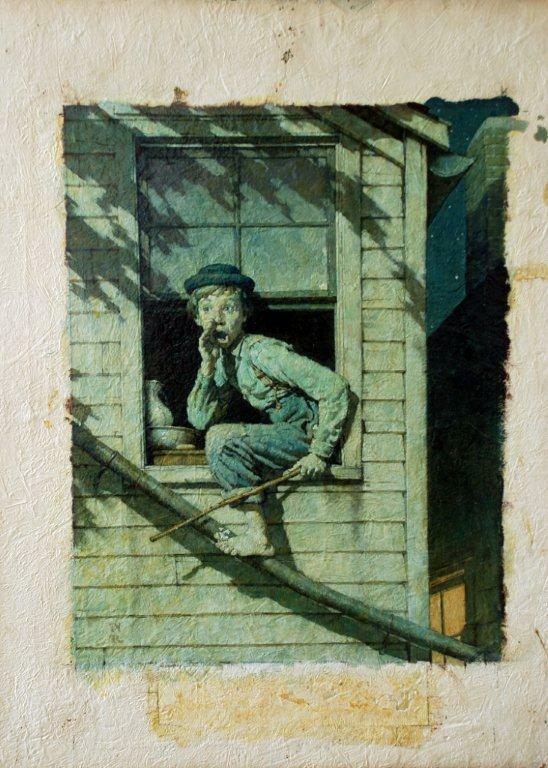 Fifteen original Norman Rockwell oil paintings created for special editions of Tom Sawyer and Huck Finn are featured in the Museum Gallery. One original early stage preliminary drawing and lithographs of the final preliminaries for the eight Tom Sawyer paintings are on display along with an original sketch inspired by his work with Tom Sawyer. Busts of Mark Twain include likenesses by Walter Russell, Don Wiegand, Father Louis McCorkle, and Emil Seletz. Paintings of Mark Twain and family members are on display. Several of Mark Twain’s works have been turned into motion pictures. The museum has more than 50 posters and 60 lobby cards used to advertise these films, with a strong emphasis on the 1938 David Selznick production of The Adventures of Tom Sawyer. These include foreign language versions. The artist Dan Beard was selected by Mark Twain to illustrate A Connecticut Yankee in King Arthur’s Court. The museum has fifty-four of Beard’s original pen and ink drawings which have the artist’s notations as to cropping and size and page location. Many are on display. Many photographs of Mark Twain.Clemens family members. Mark Twain sites and memorials around the world. Historical pictures of Hannibal and the museum properties. Mark Twain Boyhood Home – the house where the Clemens family lived from 1844 to 1853 and inspiration for Tom Sawyer. The Becky Thatcher House – home for the Hawkins Family. Laura Hawkins provided the model for Becky Thatcher in Tom Sawyer. John M. Clemens Justice of the Peace Office – the building used by Mark Twain’s father while justice of the peace and holding court sessions. Grant’s Drug Store or Pilaster House – Dr. Orville Grant lived here. The first floor is outfitted as a period drug store.